Optics-wise, things haven’t been rolling Namaste Technologies Inc (CVE:N) (OTCMKTS:NXTTF) (FRA:M5BQ) way in the last few weeks. We all know about alleged Montreal cannabis party transgressions, and the high-profile hit pieces published by Citron Research and Seeking Alpha. Warranted or otherwise, the company is looking to stem the damage by hanging onto a preliminary hourly higher-low base and psychological $2.00/share threshold. We examine whether that is an attainable short-term objective. While I won’t rehash the withering publicity Nasmaste Technologies has garnered recently (Namaste investors, or potential investors, know exactly what’s out there), the company made headlines by delivering its rebuttal. Yesterday, the company disseminated a presser dubbed the Namaste Provides Official Response to Recent Publications. In it, Namaste addresses a couple of key contention points, including its pending NASDAQ application and sale of U.S. assets. Regarding the former, the company stated, “Its NASDAQ application is progressing but has not yet been accepted or approved”, while addressing the latter by asserting, “The Company’s sale of its US assets was not to a “related party” and was not a “related party transaction” as defined under applicable Canadian securities laws and that other assertions made by Citron are equally inaccurate and misleading.” No rebuttal of Namaste Technologies’ alleged Montreal transgressions were acknowledged. Not lying down, Namaste Technologies also hit back by suggesting Citron Research is a biased and unethical organization. 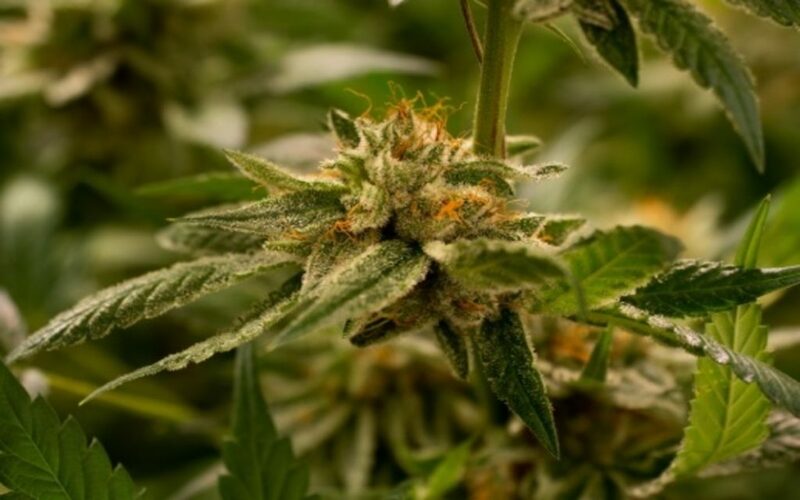 Specifically, the company notes that, “Citron has previously published false and misleading information in respect to the Company as a means to manipulate the Company’s share price”, while targeting the cannabis sector in the past. Most infamously, Citron Research publicized a rather ill-conceived short-sell call of Tilray Inc. stock starting at around the $65.00/share level. In the subsequent 12 trading sessions, TLRY proceeding to touch $300.00/share in a high frequency algorithmic-fueled short squeeze. Lastly, Namaste cemented their hard line approach by claiming it is “prepared to pursue any legal remedies it deems necessary to protect its rights and its reputation”, while “responding strongly to false and defamatory statements such as those mentioned in these publications.” While that statement leaves much room for interpretation, it appears Namaste will become more proactive in counteracting such negative messaging in the future. Shifting towards the charts, there is some reason for optimism that a near-term bottom may be developing. The first sign is tepid recent selling as Namaste’s bearish impulse matures. Not only has a discernible triple-bottom formed on the 30-Min/hourly charts, volume is grinding to a standstill. After a ↓48.35% peak-to-trough move over the last twelve sessions, it’s going to take much heavier downside volume to move the needle further in that direction. Overbought/oversold indicators are neutral on most time frames. Furthermore, the ‘backstop’ lows around $1.90 could potentially attract dip buyers and swing traders into the stock, as a favorable risk/reward profile swings in the bulls direction. The continued risk asset pummeling taking place worldwide is seemingly having less effect on the stock at these levels, suggesting the bears may be tapped-out. If so, chances are the needle could move higher in the short-term—although I wouldn’t expect the upside response to be dramatic. I believe $2.35/share is a very achievable goal in the next few sessions, with $2.20 offering minor, but notable, resistance in-between. 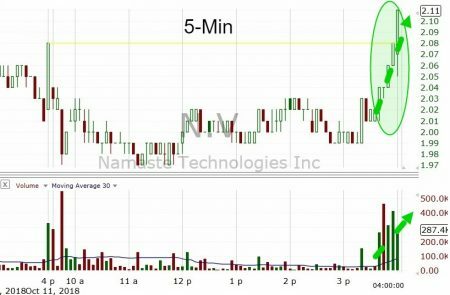 There is no easy PR fix for Namaste Technologies short term. The only real solution for the company is to put its head down, avoid controversy, and execute its business plan going forward. Fortunately, Canadian legalization is going to give them the cover and potential news flow catalyst it needs to sidestep the bad karma it’s experiencing. It is under such conditions that shifts in sentiment can suddenly occur. But for that to happen, Namaste’s stock price must first stabilize. Fortunately, we think the odds of that happening in the short term—barring a broad cannabis sector breakdown—are on their side. 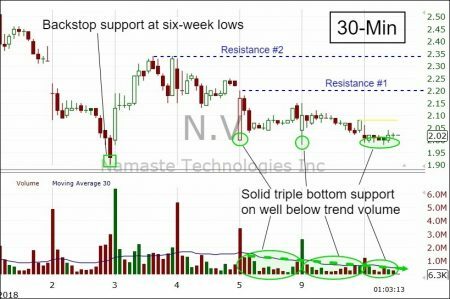 Namaste Technologies experienced a strong close, the day following this profile article. Here’s how the price action looked on the 5-min chart.